Few cultures are as passionately devoted to food as the Chinese, and two ingredients that are integral to Asian cooking are garlic and ginger. The unique tang of fresh ginger is used in everything from stews to stir-fried dishes, while the pungent flavor of garlic is featured in meals throughout China. Despite their important role in Chinese cuisine, neither plant is exclusive to Asia. Both garlic and ginger contributed to the diet of several ancient cultures. Of the two, garlic has always laid a greater claim on our imagination, probably because of the widespread belief in its curative powers. Exhausted Egyptian slaves were fed garlic to help them summon up enough energy to continue building the pyramids. The Romans swore by it, feeding it to their gladiators before battles. Medieval banquets included garlic, and there is some evidence that it provided protection against the plague. More recently, scientific researchers have credited garlic with the ability to cure everything from high blood pressure to diabetes. Garlic also rates a mention in several literary classics, including Shi-ching (the Book of Songs), a Chinese classic compiled by Confucius that features the work of poets from approximately the 12th through to the 7th century BC. Then there's the honored place garlic holds in legend and mythology, the most notorious being the belief that a wreath of garlic renders you safe from blood-deprived vampires. While not as universally renowned, ginger also has its fans. The Egyptian diet included both garlic and ginger, and the same can be said for the Romans. Marco Polo mentions ginger when writing about the wealth of spices he found during his travels along China's famous silk route. And no less a royal personage than Queen Elizabeth I has been credited with inventing the gingerbread man. It is difficult to trace the origins of garlic, which is a member of the same family as the onion. Some experts believe it originated in Russia's Siberian desert and then spread throughout Asia, the Mediterranean and finally Europe. But whatever its birthplace, the Chinese were using garlic by 3,000 BC. As for ginger, experts say it is probably native to southeast Asia -- certainly the Chinese have been aware of ginger since ancient times. 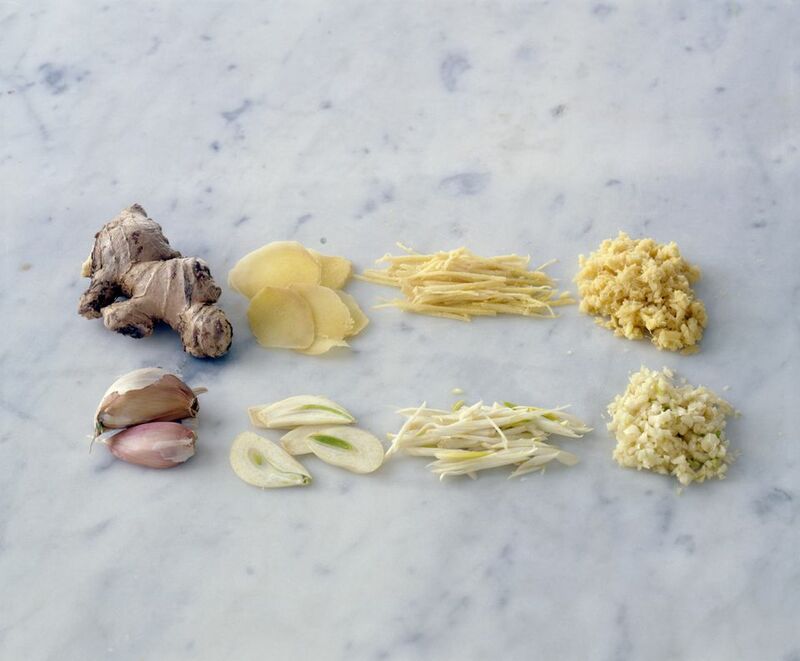 Chinese herbologists have long been convinced that both garlic and ginger have medicinal properties. Herbal preparations containing ginger or garlic -- along with other ingredients - have been used to treat everything from HIV symptoms to Raynard's disease, a rare condition characterized by an unusual sensitivity to the cold. And ginger tea is often prescribed as a digestive aid. But whether or not you're a fan of herbal remedies, it is a fact that both plants are conducive to good health: ginger is loaded with Vitamin C, while garlic contains vitamins A, C, and D.
Garlic's pungent odor features prominently in Szechuan and northern-style cooking. Szechuan dishes are famous for their incendiary spicing. Less well known is the fact that in China's northern area, where harsh winters make for a short growing season, northerners rely on the onion family -- including garlic and green onions -- for seasoning their food. Ginger is a common ingredient in Cantonese cooking, which is characterized by subtle seasoning and a light touch with sauces. Szechuan cooks also make liberal use of ginger, and many dishes contain both ginger and garlic. Hot and Sour Soup, originating in Szechuan, is one example. But these are generalizations: both garlic and ginger can be found in dishes throughout China. And of course, both of these aromatics are used to flavor the oil in stir-fries. Ginger comes in many forms: fresh, ground, preserved and pickled. Although dried ground ginger is used in some dishes, it should never be substituted for fresh ginger. Fresh and ground ginger can be found in most grocery stores, while preserved and pickled ginger are available at Asian markets. Unpeeled ginger should be stored in the vegetable crisper section of the refrigerator. Wrapped in a paper bag, it will last for up to a week. For longer storage, tightly wrap in a plastic bag; the ginger will last for up to 1 month. For longer storage in the refrigerator, another option is to peel the ginger, cover with sherry or vodka and place in a sealed jar. Ginger stored in this manner will last up to three months. Finally, ginger can be frozen. Garlic should be stored in a dry and cool place and not refrigerated.